KOSCIUSKO — Last year, the city of Warsaw ran an immensely successful crowdfunding campaign for the Warsaw Alley. Its goal was $50,000 in order to receive a $50,000 matching grant from the Indiana Housing and Community Development Authority. Well, not only did it meet its goal – it exceeded it. With the support of 144 donors, $58,795 in funds raised and $50,000 in matching funds, by the end of last summer, Warsaw had a beautiful new public space to enjoy. The Kosciusko Chamber of Commerce wants to do this again. But this time, the county wants to address some issues at the Courthouse lawn. The lawn is right in the middle of downtown, and so it gets used quite often by residents and visitors enjoying downtown events. But open grass doesn’t hold up well to heavy use; it’s getting expensive for the county to maintain the lawn, and closing the lawn completely has been discussed. But the chamber really doesn’t want to keep people from using such an important public space; instead, it wants to make it more usable. 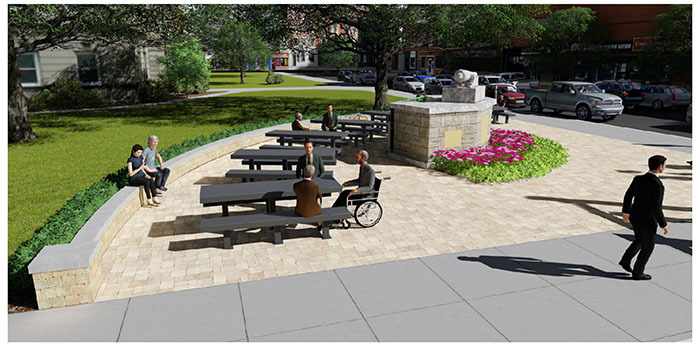 For this reason, the county wants to build a beautiful and functional plaza on the southeast corner of the courthouse lawn. The chamber is excited to provide this new gathering space in downtown Warsaw, but just like with the alley, it needs your help to make it happen. Every year more and more is happening in downtown Warsaw, bringing more people downtown and creating a need for spaces where people can gather and enjoy time with friends or family, or spend a nice afternoon on their own. The Warsaw Alley has been a beautiful addition to downtown Warsaw and a great start for adding gathering places downtown. 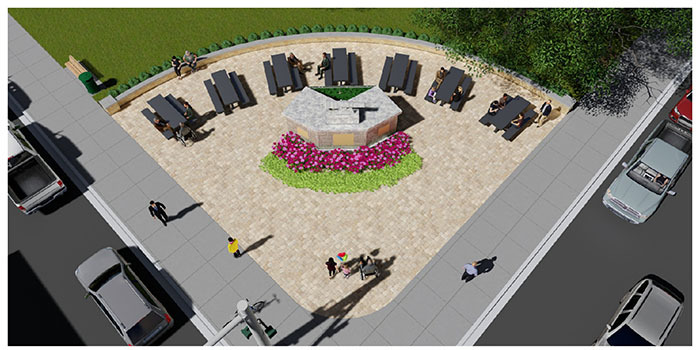 The chamber wants to build and expand on that legacy with this new plaza. With the growing popularity of events like First Friday, downtown restaurants and other businesses, and amenities like the Alley and the bikeshare, and with Buffalo Street facing some exciting updates thanks to Regional Cities, now is the perfect time to continue this momentum with the Courthouse Plaza. You may mail checks – made out to Kosciusko County. Please mail your checks to Kosciusko Chamber of Commerce, Attn Michelle Goble, 523 S. Buffalo St, Warsaw, IN 46580. Please be a part of this exciting project by donating and then telling your friends, family, colleagues, neighbors and even acquaintances to donate too. Every little bit helps – even $5!